I talked to Hot Doug Sohn a couple of months after his Check Please episode. He said it took about six or eight weeks to go back to normal. I asked if he'd really been able to tell the difference on, say, a Saturday and he said oh yeah, instead of going out the door the line went down the block. I am becoming utterly convinced that going out on Saturday night (and sometimes Friday and Thursday) is insane unless you have reservations somewhere. You just can't get in anywhere - if you drive you're taking your life in your hands (and probably can't park anyway). We're doing more meeting up with people on Mon-Wed and Sun. I totally agree. I have almost ceased "Saturday Night" and prefer Sunday night, Saturday afternoon and Wednesday night. I can always get a seat at the bar (my favorite place anywhere) and benefit from more focused service. VIPchef wrote: The HopLeaf is great but the service needs an attitude adjustment. Yes, and that's not just a response to Check Please crowds. Hopleaf has always had bad service. I don't know about the new staff they have hired due to the addition of food, but the bartenders have always been generally rude and act like you giving them bussiness is a burden to them. I've known beer geeks who live around the corner who stopped going, because after years of being a regular they got tired of the cold service and were never given a comp once. I've always found the owner to be a bit unfriendly too. In sharp contrast, the bartenders at Maproom are light years more knowledgeable and friendly. Hopleaf has helped to educate Chicagoans about the beauty and variety of real beer, and for that I tip my hat to them. The quality of their draft list is probably second only to Maproom, and they probably have the most extensive bottle list in Chicago. I do stop in when I'm in the area. I used to live near there, but my wife and I moved to Bucktown in large part b/c we wanted our regular tavern to make us feel like we were regulars, and that is the Maproom. Maproom has an equally impressive list of Belgian drafts (including Kwack), but they rotate beers more often have more unusual selections, both import and U.S., that the other good beer bars in Chicago rarely do. Someone mentioned Yard House out in Glenview. Yards is a big west coast chain. I haven't tried the one here, but have tried a few out in CA. In my estimation they have many many taps of swill and mediocre stuff, but fewer quality craft brews than all the other places mentioned in this thread. Also, they simply have too many draft lines, considering that most patrons are drinking pedestrian beers. The result is that their beers tend to stale and sometimes have "off" flavors from sitting in the tap line too long. I would be suprised if they had anything on draft that would warrant a trip out there, unless you were already passing by. Their one possible plus would be if their California connection meant they had a few West coast beers (like those from Stone Brewing) that are not available anywhere else in IL, but that would require that they are serving as their own distributor. griffin wrote: Someone mentioned Yard House out in Glenview. Yards is a big west coast chain. I haven't tried the one here, but have tried a few out in CA. In my estimation they have many many taps of swill and mediocre stuff, but fewer quality craft brews than all the other places mentioned in this thread. I agree this place doesn't match the high quality of the selection of other places mentioned. They actually have their tap selection on line. I don't know if it's up to date: http://www.yardhouse.com/menu_beer.asp?id=11. There are some winners. Their one possible plus would be if their California connection meant they had a few West coast beers (like those from Stone Brewing) that are not available anywhere else in IL, but that would require that they are serving as their own distributor. Not likely. But if you want Stone beers, they're available just over the state line in IN. The 3 floyds brewpub in Munster even has a couple on tap. VIPchef wrote: I arrived an hour prior to the tasting to have a bite to eat and I was hastily led upstairs only to be informed I could eat downstairs at the bar. She seemed overwhelmed despite the fact that the dining room was not that busy (as compared with other visits). They might be overwhelmed by the boost in business, but hey, they are in the service industry. With that much business, they should have no problems hiring more staff. Funny you should mention the overwhelmed host(ess). When C2, The Wife and I went there a year or so ago, it was remarkable how flustered she became over seemingly simple tasks like, you know, seating people. We may not be talking about the same host; it's possible confused hosts are endemic to the place. Odd. griffin wrote: but my wife and I moved to Bucktown in large part b/c we wanted our regular tavern to make us feel like we were regulars, and that is the Maproom. After an endorsement like that I couldn't help but stop at the Map Room yesterday. It had been a while, but, of course, nothing had changed, which is good as the Map Room is one of Chicago's great bars. Nice mid-afternoon crowd seeking Saturday afternoon refuge from the arctic temperatures, on-the-house spread of Leon's BBQ and fried chicken, and, of course, an incredible selection of beer. I had a few Delirium Tremens, which I'd heard about, but never had. Loved the beer, but at 9% it's aptly named. I didn't try any of the Leon's, which came from the Ashland location, as I had eaten lunch at Honey 1 earlier, though it's nice of the Map Room to have free food on the weekends. Actually, if I remember correctly, last time I was at the Map Room, over a year ago, they had a spread from one of the Ethiopian restaurants. G Wiv wrote: I didn't try any of the Leon's, which came from the Ashland location, as I had eaten lunch at Honey 1 earlier, though it's nice of the Map Room to have free food on the weekends. Actually, if I remember correctly, last time I was at the Map Room, over a year ago, they had a spread from one of the Ethiopian restaurants. Glad you liked the place. The BBQ on weekends is relatively new and I haven't tried it yet. I am betting that when you saw the Ethiopian food was a Tuesday night. Tuesday is "International night" and they have food from a different country catered every week. It is Free as long as you buy 2 drinks. They serve it at 7:00. It is often quite crowded on Tuesdays and hard to find a seat if you arrive after 6:30. Also, every Monday at 5:00 Belgians like Delerium Tremens are $1 off and they lay out a free spread of sausages and cheeses, with numerous mustards to choose from. G Wiv wrote: I had a few Delirium Tremens, which I'd heard about, but never had. Loved the beer, but at 9% it's aptly named. SO and I tried to go to Hopleaf last night. We arrived around 7:45 and were told wait was 1 hour for a table. Being too hungry to wait and not knowing the area, we walked north until we came to Charlie's Ale House. I had a pretty decent burger and the wife had the southwestern chicken flatbread. (looked like a pizza to me) which she said was very good. Anyone know if the Check, Please impact has died down at all. I'm supposed to be meeting people here for dinner tonight (around 7, 7:15), so I want to know what to expect. jesteinf wrote: Anyone know if the Check, Please impact has died down at all. I'm supposed to be meeting people here for dinner tonight (around 7, 7:15), so I want to know what to expect. This is one of those situations (like LSC) where I think the perceived "Check, Please Effect" is overblown. It was crowded before and it's still crowded. Weekend dinner time, you can expect a crowd and a not-insignificant wait. Anyway, I am sorry that I missed the Hopleaf ep of C,P because...I am in it. My wife and I, with another couple, were at a table near the corner of the room. (used to live in rogers park) and the beer selection brought us in. We return now on our trips to/from Devon shopping. Surly service was always an issue. This was our first trip for food -- a thursday night -- we got there right before 8 and it was busy as usual. As for Hopleap, much to our surprise, service as also excellent. Both the host who seated us and the waitress were great. There was a little confusion on beers (brought a Goose IPA in stead of the Pere Jacques, big difference), but she comped the mistake and took care of it with good humor. This was unheard of in days of yore. Happy to report that hopleaf is worth the hype and the wait, especially if you like good beer! Looks like a beer garden may be in the making in back as well. I too had a comped beer and the bartender introduced himself on my last visit (this was at about 4 p.m.; the benefits of student life). I overheard him talking with someone else about the fact that people have said the bartenders are rude. I'm in there about once every three weeks and while it is always the same bartender (who is always fine), given the other remarks he made, I'm inclined to believe that the powers that be are pushing an attitude of gratitude rather than acknowledging me as a very marginal "regular." Regardless of the reason, a Leffe Brune on the house is never a bad thing. I agree about the mussel broth. I always ask for another piece of bread to sop it up. In addition to the excellent mussels and frites my wife mentioned above, we also had the beer-braised brisket sandwich and shared 3 appetizers with friends. The brisket had too much horshradish sauce on it which overpowered the other flavors. It was pretty good, but not nearly enough brisket for the amount of bread or for the $10 cost. All were a little expensive for what you got. The Leek, bacon, and emmanthal cheese tart $8 was quite delicious. The Crab and Salmon cakes $12 were a bit dry and more salmon than crab. The Scotch Egg $8 was good, but overpriced. It's a hard boiled egg, wrapped in ground sausage, breaded and fried. The best part of it was that they seemed to soft-boil the egg, so that even after frying, the yolk still had some moist, bright orange parts to it. BTW: The 3-Floyds brewery down in Munster has a very good scotch egg that is slightly smaller, but only $2.50. The Leek tart is very good and worth the $. The mussels are the only item where you feel like your getting a good value. They are a very good deal. The Mussels for 2 is $20 and comes with over 50 plump mussels, tasty broth and a small cone of frites for dipping. Contrary to my previous post about their history of surley bartenders, the host and our waitress were very friendly and good humored. My party encountered a problem with the bartender on our last visit there as well. Perhaps he is not pleased with the Check Please Effect either, or better yet, he has a poor attitude in general. It resulted in 20 people not patronizing the establishment that night and possibly for the future. I hate for my post #1 to be negative, but in 30+ years on this planet, I've never received ruder service in my life than I have from the middle aged female bartender at Hopleaf. This comes from someone who normally doesn't pay too much attention to level of service....serve my food fairly quickly...fill my water/beer...I'm good. I loved the beer. I loved the food (I had the mussels in the wine sauce). That bartendress wasn't particularly inattentive or "flighty". I can handle that. This woman actually went out of her way to be mean to a group of 6 of us. To be fair, the rest of the staff was pleasant enough. She, on the other hand, was over the top. I asked someone sitting next to us if she was new or perhaps she was just having a bad day. He said she'd been there over 10 years and was pretty much always like that. Oh well, I wish it was different as everything else was great. The mussel broth spoon is a great idea! Surely I can't have been the only one to, after finishing the bread, dipped frites in winey mussle soup. I can add additional data points with regard to the service. Late last summer or perhaps early fall (I forget), the girl I was seeing at the time was a big fan of mussels. We went to Hopleaf twice. Each time, we were seated promptly and were impressed with the service. I made a naive beer choice that the server politely suggested may not properly complement the mussels. During both visits, the server engaged in easy conversation and rolled with my bad jokes. Having read this thread, I kind of want to sit at the bar for a while to see this rude bartender for myself. Since I have contributed to the "rude" impression, I should say that I'm not sure the bartenders I was referring to (and whom I've heard friends complain about) are still there. They were there for several years at least up until a couple years ago. But we stopped going regularly and in our mere 2-3 visits in the past year, the bartender was someone I didn't recognize and we had minimal interaction with him. • the overall platter struck me as more French than Belgian in spirit, from the cut of the meat to the rather thin size of the frites. Not to say that similar offerings cannot be found in Belgium but over many, many years of experience, this is not the sort of 'abstract ideal’ or 'typical' version one might well expect from a place that advertises itself as offering Belgian fare. This is perhaps not very serious criticism -- in a way, not criticism at all, if the steak-frites is good (and it was) -- but I do think it worth noting. • places in Belgium that specialise in or serve vast numbers of steak-frites -- and Hop Leaf does seem to do that – very often and, indeed, normally offer diners two meat related choices: 1) cut of meat (at least a couple, sometimes several cuts are offered); 2) size of meat portion (many places will offer a range from 200 grams on up, though never in the caveman sizes of American steak houses). • in addition to the choices regarding cut and portion size of the meat itself, most places known for their steak-frites and almost all basic restaurants that regularly serve the dish offer a number of different sauces to go with the steak. No sauces are offered at Hop Leaf, all steaks coming with herbed butter (which, again, is quite tasty, but definitely not my preference when sitting down to a Belgian-style steak-frites). • the frites were thinner than they typically are in Belgium and sufficiently so that they tended to the crispy side and lacked the glorious contrast of crunchy outside and soft inside that the type which I favour has. But again, I thought Hop Leaf's fries were quite tasty and I left none behind. • most places in Belgium automatically bring a second bowl of freshly fried fritten/frites when they see the diners are running low -- no extra charge. This would probably be considered a bad business practice here in the States but it is also one of the many reasons I hope to move back to Belgium one day. • this is a criticism: Belgium steak-frites platters in my experience always come with a little mound of vegetational relief from the meat and potatoes. Sometimes it's not very voluminous and not too much more than a garnish, but it's there and it is meant to be eaten and, to my mind, serves as an essential element to the meal. Water-cress, frisée, some mixed greens... whatever, but something that is fresh and palate-cleansing is there. Hop Leaf serves the steak-frites without even the most minimal vegetation which strikes me as a real shortcoming, especially since the diner who wishes to have a balanced meal must then choose from one of three $8 salads (all of which are too complicated and heavy to serve as a simple accompaniment to a steak-frites meal). * In my estimation, they ought to give a little something on the platter and, if they feel the need to keep it more garnish like in size, they really should add a simple salad and perhaps one or two vegetable contorni, as it were, to the menu. To me, a heap of fried potatoes and a piece of meat alone is a little barbarous. And even lobbyists for the Dairy Council might agree that herbed butter is even less of a vegetable than ketchup. • In Belgium, one typically drinks wine with food, including steak-frites, though it is considered absolutely normal to drink beer with simple, traditional (non-high-fallutin') dishes such as steak-frites or moules-frites or carbonade or stoemp. 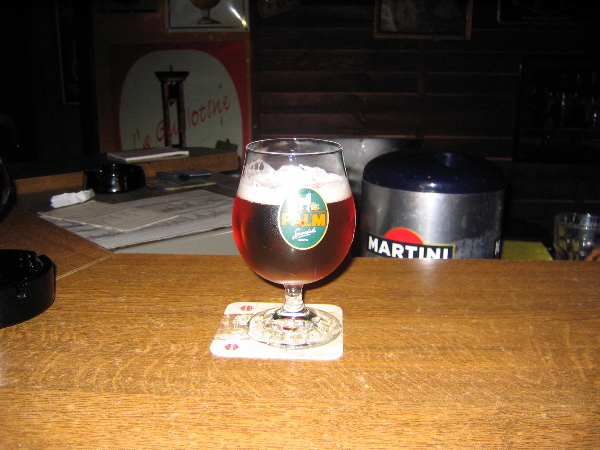 But the beer drunk then is traditionally and still normally a simple basic beer, a Stella or a Jupiler or Wieze or Roman or whatever the local equivalent is. No such basic beer was listed among the on-tap offerings. If they don't offer one, they should. If they do, they should list it and not just steer diners to stronger, more expensive beers, which to my mind aren't for the most part meant to be drunk with food. • Given the $18 for the steak-frites, the $8 for the salad, and the cost of the strong and flavourful beers that one perhaps ends up drinking in place of a simple pintje (though these are also pretty expensive chez nous), the cost of a steak-fritten-en-pintje easily climbs up to and over the $35-40 range. In Belgium a steak-frites meal of comparable and even superior quality can be easily found outside of tourist-zones for a good bit less, along with the bottomless bowl of fritten. Indeed, to my mind, one of the marvellous things about Belgium is how well one can eat for relatively modest amounts of money and, as the sort of ubiquitous national dishes, steak-frites and moules-frites / biefstuk en fritten and mosselen en fritten, can be found most everywhere with – from an American perspective – a remarkable pairing of high quality and relatively modest price. Of course, Hop Leaf is in Chicago and, moreover, it is, -- so far as I know -- the only place in town that advertises itself as being (in some sense at least) Belgian, and so they have the opportunity and right to ask what they can get. And so it’s not cheap, but in fairness, I don’t think Hop Leaf’s prices are outrageous. So then, I really enjoyed Hop Leaf and will happily return if and when the occasion arises. Insofar as the above points are or can be construed to be criticisms, they are for the most part (save the – in my estimation – egregious lack of at least a little vegetable matter on the steak-frites platter) instances of nit-picking. But then this is a site where we should be able to pick such nits. Eyet mi, dji so todi la po dîre åmèn. * Amata and I split a salad with endive and blue cheese and it was really very nice, but the blue cheese was to my mind a bit over the top, in the overall context of the meal, given the garlic mayonnaise and the herbed butter and beef fat and fried potatoes. It's not quite a salad, but the one time I had the steak frites at Hopleaf it did come with some well above average green beans. It's a shame they got rid of it.. They also, after that first trip, got rid of the unbelievably fantastic BLT (with nueske bacon, roasted tomatoes, lettuce, and aioli). And on our last visit (post-Louisa-Chu-dinner) we didn't get any aioli with the frites that came with our meal, although they were happy to bring some out when we asked. gleam wrote: It's not quite a salad, but the one time I had the steak frites at Hopleaf it did come with some well above average green beans. It's a shame they got rid of it..
Antonius wrote: In Belgium, one typically drinks wine with food, including steak-frites, though it is considered absolutely normal to drink beer with simple, traditional (non-high-fallutin') dishes such as [i]steak-frites or moules-frites or carbonade or stoemp. But the beer drunk then is traditionally and still normally a simple basic beer, a Stella or a Jupiler or Wieze or Roman or whatever the local equivalent is. No such basic beer was listed among the on-tap offerings. If they don't offer one, they should. If they do, they should list it and not just steer diners to stronger, more expensive beers, which to my mind aren't for the most part meant to be drunk with food. Last time I was at Hopleaf, I had the moules-frites and a big beaker of Duchess of Bourgogne (not exactly a "basic beer"). I enjoyed the sour-tart brew with the bivalves, but when I read your post I thought, "well, maybe the idea is not to overwhelm the food with the beer, or vice versa." Or maybe it's just not the way it's done in Belgium, which is reason enough to try a simpler beverage when eating the Hopleaf menu. Still, I dig the Duchess, and because I get it almost never unless I'm at Hopleaf, my tendency might be to quaff it with or without chow. "when we streakfritify at home"
This will very likely be the best verb I hear all month. It was approaching dinner hour, and I was close to Andersonville . . . so I suggested to a friend that we stop at Hopleaf for a beer and something light to eat. This was my first visit, and, on the way out the door after an hour and a half - I said to myself, "I like this place!" It was early - 6 p.m.. The front room was almost full, and the back about 2/3 empty. I walked through the front to the back to see what it looked like, and quickly decided to go back to the front room. I didn't find the back room very comfortable feeling. We grabbed the next to the last table in the front, ordered an excellent beer (from Oregon, I'm thinking - really unusual in taste - beet sugar, rasins, etc., etc.). To eat I ordered the sausages appetizer plate and my friend ordered the ham sandwich. I'm a non-smoker, and the large number of cigar smokers present and the smoke generated by the cigar smoking started to make me uncomfortable. We sere sitting at the first table in front of the door as you enter and the doorman standing there heard me comment about the smoke, and he opened the front doors to air the place out. It was a nice, and appreciated gesture - whether it was meant to accommodate me, or just a regular activity of his. The sausages were very good, and the beer a good match. My friend raved about his sandwich, and commented about he coleslaw (or whatever) inside the sandwich. The fries accompanying the sandwich were some of the best I've ever tasted. We were interested only in a couple of beers and a light snack, and Hopleaf surpassed the expectations I had. It's definitely a people-watching place, with a good and comfortable mix of ages, genders, sexual preferences, lifestyles, etc., etc. I found the place to be very comfortable. I can see myself spending lots of time there, if I lived closer (or had a car!). The beers were $5 apiece, the food $10 apiece, and we found a parking spot at a meter around the corner on Foster Ave. When we left the place it was filling, and a few people were waiting in back to be seated in the dining room. After we left we walked N. on Clark St. to see what's been happening, and noticed most restaurants were almost empty; I was surprised. I also had a look at Ann Sather's - with all of its lights on, and a window open . . . and it looks as if they've reopened during daytimes (did I miss mention of this here on LTH earlier, after the "closing"?). Bill wrote: I'm a non-smoker, and the large number of cigar smokers present and the smoke generated by the cigar smoking started to make me uncomfortable. Dammit! I've never been to Hop Leaf, but have had it on my list for awhile. But my personal feeling about cigars is that Bill Clinton had found the only really acceptable use for them. Now I'm feeling a little leery of heading on up to Hop Leaf. If you want to eat, though (and order any of the beers or wine they offer) you should know that the restaurant seating is very separate from the bar area (some of it upstairs) and is all non-smoking, so any bar smoke won't bother you there. We tried to go last Saturday night at about 6:30, but the wait for a restaurant table was over an hour, so one should know that as well. I remember Hopleaf in years past, when the front room was incredibly smoky. Last few visits, the smoke level has decreased dramatically. The smoke is still there, but if you wander (or stumble, depending on how many of the Belgian Trippels you've had) around the neighborhood for a while, your clothes will air out.